Shopping for specials for a large crowd event is not as daunting as it may seem. Plan ahead by making a thorough list of what you need to purchase with the dinner planner that you created when you first began with the idea of having a party. With the written planner you should have all the information you need at hand for your cooking for a crowd recipes. Never go shopping for specials without a complete list made out for your large crowd event. Recheck your list; it should have every item that you will need for your meal for a crowd. This list should also include any paper products. Even though I prefer china and cloth napkins for dinners, buffets and special occasions, it might be necessary for you to use paper items. If so, everything should be on your list. If you are going to be using foil or other wraps, list it. If you are going to be serving appetizers for a crowd all the ingredients should be on your list. The same goes for salads and desserts. When cooking for a crowd, the list of ingredients rises quickly and this means “money”. One thing I have found very handy when I give a party is estimating the actual dollar amount before I ever start my shopping for specials. This is not that hard to do when checking the advertisements and making my phone calls. You would be surprised at how close you can come by estimating. Knowing how to shop for specials wisely can save a lot of money; especially when cooking for a large party. Start by looking for bargains from the local newspaper advertisements. Before visiting your grocery store call the manager and ask if there are any specials. There might be some unadvertised store specials or if the manager knows you are looking, he might want to clear some items out. 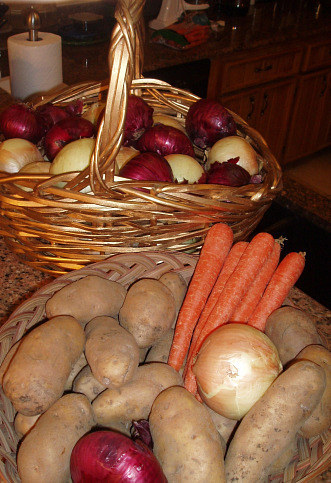 Local farmers markets usually have great produce at much better prices so check these out. Sometimes the local meat markets might offer better prices on meat. Make all your calls and take notes; do all this from home and save the gas. As I have often said, “have all your ducks in a row “before heading out to grocery shop. Have on your list what you are going to buy, how much you are going to buy and where you are going to buy it. This will save you time, money and much frustration. The following is a list of items you might need for your party or dinner. It is for 25 people; multiply or deduct for your group size. When shopping to cook for a large crowd, we usually want to save money. The following is a delicious recipe to feed a lot of people. 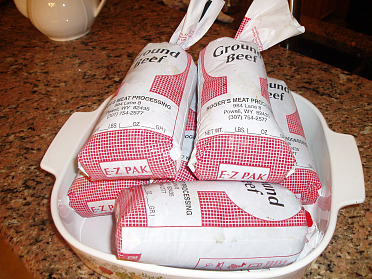 In a large stock pot brown beef, onion and garlic; drain excess grease. Add tomato sauce, paste, salt, sugar and seasonings; bring to a boil. Reduce heat, cover and simmer for 2-3 hours stirring occasionally. Serve over cooked spaghetti. Yields about 50 cups (1/2 cup for each serving). NOTE: For serving large crowds, I usually precook the spaghetti (Do not overcook). I drain it well and toss with a little oil. When ready to serve, I have a large pot of boiling water ready. Quickly dip (In colander) small portions of the spaghetti in the boiling water only to reheat. Shake off the water and place spaghetti on warm plates. When shopping for specials for crowd size recipes, a recipe for macaroni and cheese will always turn up. This is a favorite dish of many people. This is a very large recipe and for the economical side you can cut back on meat or even eliminate it if necessary from the meal. In large kettle melt 1 ½ cups butter over low heat; stir in flour, salt, mustard and pepper until smooth. Remove kettle from heat and gradually stir in milk until smooth. Place back on medium heat and stirring constantly cook until thickened about 10 minutes. Stir in ¾ of the grated cheese until melted. Put cooked macaroni in large greased baking pans; pour cheese mixture over the top and mix well. Mix remaining cheese with bread crumbs; sprinkle over top of casseroles. Dot tops with butter; bake for 25 minutes or until topping in lightly browned. When shopping for specials to make a crowd size brunch recipe, try this simple recipe. To save more money the biscuit baking mix can be made instead of purchasing. Sauté sausage; drain, move to another pan and let cool. Sauté onions in small amount of sausage fat until tender; move to sausage pan. Blend eggs and cheeses together and add to sausage onion mixture. In a large bowl combine baking mix, milk and mayonnaise. Spread ½ of the dough equally between 2 10 X 15 inch baking pans. Spread sausage mixture evenly on top of dough in pans. Blot remaining dough equally on top of sausage mixture in both pans; flatten with fingers. Bake each one individually for 30 minutes. Makes 32 to 34 servings. NOTE: These can be made ahead and frozen. Another great economical recipe when shopping for specials to prepare a crowd size recipe. Sauté onions and green peppers in butter; combine all ingredients except cheese. Divide mixture evenly in 2 greased baking pans 9 X 13 inches each. Bake for 1 hour; sprinkle cheese on top of hot casseroles.